Railway Recruitment Board (RRB) Thiruvananthapuram has notification of document verification for Finally Selected candidate for the posts of Assistant Loco Pilot ALP Category No. 01, 16, 18, 38 &67 of CEN 01/2014) Pay Scale Rs. 5200/ --20200/ - Grade Pay Rs.1900/- based on the performance in written examination which was conducted on 13th July 2014 and Aptitude test which was conducted from 10th October to 20th October 2014. The document verification is scheduled on 26th February 2015 onward. The individual letters showing exact dates and time for document verification has been sent by posts/ courier to the successful candidates. Earlier RRB, Thiruvananthapuram has released list of successful candidates / result of Assistant Loco Pilot and Technicians against CEN 01/2014 on 04th February 2015. 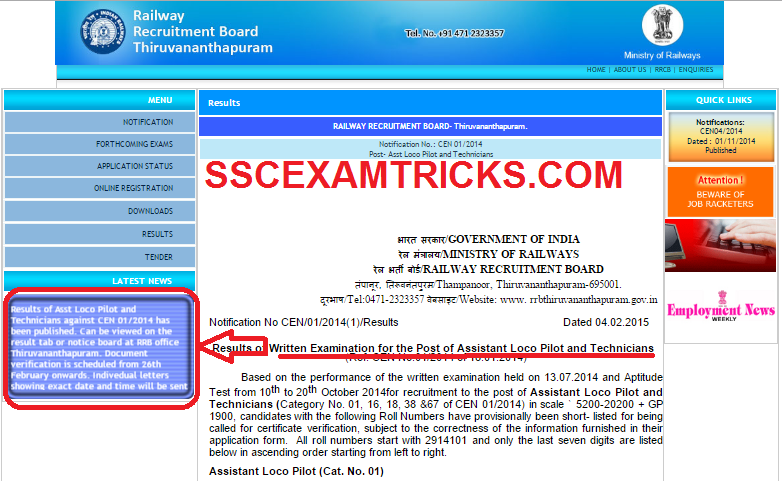 This result can be viewed on the result tab or notice board at RRB office Thiruvananthapuram. A total of 132 candidates has selected for the posts of ALP and waiting for their appointment letter and get their Appointment Letter very soon after the verification of their original documents. The document verification is done to check / match originality of the successful candidates. It is mandatory for candidates to submit photocopy of original documents duly attested by gazetted officer with name, designation and office seal clearly visible, for submission to this office. The written exam for RRB ALP Technician 2014 was conducted on 13th July 2014. The qualified candidates of written test were called for aptitude test which was conducted on 10th to 20th October 2014. Candidate must bring original documents along with a photocopy set of original documents such as 10th, 12th, Graduation, Diploma or others along with domicile and caste certificate. Candidate should bring two passport size photographs at the time of getting appointment letter of Assistant Loco pilot (ALP) Posts. Candidates are advised to bring at leave two coloured photograph. 4. NOC (for serving employees),discharge certificate (in case of Ex-Serviceman) etc. The candidates should also bring one set of photocopies of all certificates attested by a gazetted officer, with name, designation and office seal clearly visible, for submission to this office. A Final Merit list of candidates/ Final Result/ List of Selected Candidate sheet is prepared based on the performance in interview and written examination.